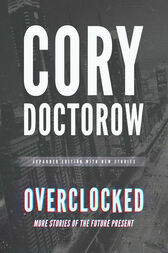 New York Times bestselling author Cory Doctorow has been hailed as one of the freshest voices in science fiction, and this collection of intriguing novellas is yet another reason why. “Anda’s Game” is a spin on the bizarre new phenomenon of “cyber sweatshops,” in which people are paid very low wages to play online games all day in order to generate in-game wealth, which can be converted into actual money. Another tale tells of the heroic exploits of “sysadmins”—systems administrators—as they defend the cyberworld, and hence the world at large, from worms and bioweapons. And yes, there’s a story about zombies, too.